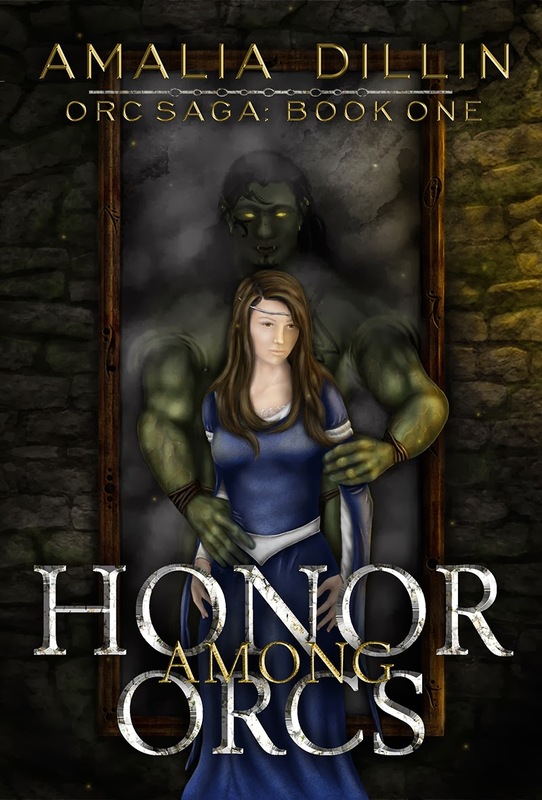 Good To Begin Well, Better To End Well: Honor Among Orcs Cover Art! I am so, SO excited to share my cover art for Honor Among Orcs with you today! long time readers of the blog might remember me talking about this book under a different name -- Orc Romance -- and ever since those early days, this book as been one of my absolute most favorite manuscripts. Don't get me wrong, I love Fate of the Gods too (and Thor! so much ThorLove!) but Honor Among Orcs surprised me in so many ways, and as a writer, I think writing this manuscript was one of those "level-up" experiences that helped me to grow. Basically, I'm really proud of this book. And I'm just as proud of the cover art, created by Melissa Stevens, who somehow, someway, reached into my brain and produced Bolthorn EXACTLY the way I had imagined him, all the while being an absolute dream to work with. Tolkien meets Beauty and the Beast in this new romantic fantasy by Amalia Dillin, author of the Fate of the Gods trilogy. And finally, the art itself! And with this reveal, let me also say -- I'm looking for around 20 advance readers for Honor Among Orcs, to read and write reviews (in advance of release on Goodreads, and on release day, April 1, on Amazon/Barnes and Noble) to help spread the word about Bolthorn and Arianna! Advance reader copies are e-only (though there will likely be some goodreads giveaways of a print version, too) and available as epub or mobi files. If you're interested, shoot me an email at amaliatdillin(at)gmail(dot)com and let me know your preferred filetype! yeah, I'm not ashamed to admit I've been ogling Bolthorn for weeks. Thanks! I thought my artist captured the atmosphere of the book perfectly!! Yesssss! So glad you popped over and think it sounds awesome! I *almost* didn't cross post to the nano group, but now I'm extra glad I did! Eep! In that case, I'm doubly glad that you did! I so WANT to get an advance copy and read it now! But not being sure I'll be able to have it done by April, I know I'm consigned to reluctantly waiting.